Fan Letter #2 – The next letter is from Ugomara. They want to know what the members think of first when they think of Nagoya. Saori first quietly confirms that they’re talking about food before pondering loudly if it’s misokatsu. She suspects that this might be the easy way out of the question, since it is the quintessential Nagoya food, but then Kisora says that she has never eaten it at Yabaton, which is possibly the originator of the dish. This shocks Saori, who has to confirm that Kisora is in fact from Nagoya. Kisora specifies that she has eaten boxed lunches from Yabaton, but she has never actually gone to Yabaton and gotten a hot meal. Saori assures her that it is more delicious when it’s hot. 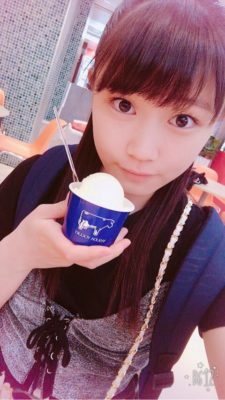 Still, Saori concedes that living in an area with a famous local spot means that one may never actually go visit that famous local spot. Kisora takes a little more time to think of her answer, now that her street cred in Nagoya has been compromised by her lack of Yabaton. Eventually, she says that her favorite local speciality is actually the shiro-noir, the most popular menu item of the cafe chain Komeda. She describes it somewhat incorrectly as soft-serve on top of bread (it’s actually a plain danish), but she talks it up by saying that there’s also a chocolate ice cream version, as well as ones with caramel sauce and strawberries to add. Saori gets more and more excited as she goes into detail and wants to go get one like right now. She can, as a matter of fact, because Kisora points out that there are Komeda cafes in Tokyo. That makes Saori less excited, though, for the same reasoning that you can get a Philly cheesesteak anywhere, but it’s special to actually eat one in Philly (maybe that’s too American? Do Europeans feel the same about eating a Berliner in Berlin? Mysteries of the world.). Note that no one told her she had to pick food, but here we are. Fan Letter #3 – Polar Bear writes in to ask for an idol’s opinion on idols. They want to know what they think the appeal of an idol is, if there’s any difference in opinion on idols once they became one, and what their general impressions are of being an idol. 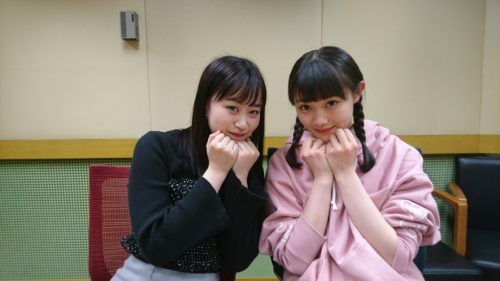 Saori says that her impressions of idols have never really changed, but one thing that happened when she became an idol was that it was harder than she expected. She admits to being bad at memorizing choreography, which means she spends a lot of time working on that, but it’s worth it because performing in concerts is the funnest part of being an idol. Kisora agrees that the lives make all the work worthwhile, so it’s not so bad. Kisora’s own answer is “cool,” according to Saori. She has always loved idols and looked to them for inspiration and motivation, so when she finally became one, she felt like she could finally try to be someone who influences other people in a positive way. And we’re back to Teion Yakedo at the end of the show. Three guesses as to who will be on the show next time. 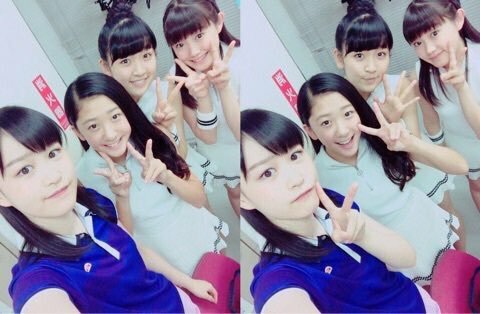 Tsubaki is by far the most interesting group in H!P currently.